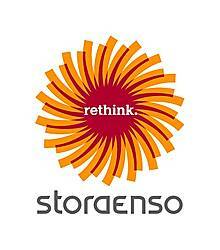 Stora Enso Oyj provides renewable solutions for the packaging, biomaterials, wood, and paper industries worldwide. It operates through Consumer Board, Packaging Solutions, Biomaterials, Wood Products, Paper, and Other divisions. The Consumer Board division develops boards for printing and packaging applications, including liquid, food, pharmaceutical, and luxury packaging. The Packaging Solutions division develops fibre-based packaging for converters, brand owners, and retailer customers. The Biomaterials segment offers various pulp grades for paper, board, tissue, textile, and hygiene product producers. The Wood Products division provides wood-based solutions for building and housing, such as massive wood elements and housing modules, wood components, and pellets for urban construction, as well as various sawn timber goods primarily for construction and joinery companies, merchandisers, and retailers. The Paper division provides paper solutions for print media and office use, which include papers made from recycled and fresh wood fibre. This division serves publishers, retailers, printing houses, merchants, converters, and office suppliers. The Other division supplies wood to the Nordic mills. The company is headquartered in Helsinki, Finland.